The HoverMatt® system is used to assist with lateral transfers and repositioning anywhere in the hospital. It is radiolucent and artifact free so patients may remain on the HoverMatt® mattress for all ancillary procedures, including Diagnostic Radiology, Nuclear Medicine, MRI¹, or Radiation Therapy. Consistent utilization of the HoverMatt® dramatically reduces back injuries to staff that are caused by lateral transfers and repositioning. In addition, fewer staff members are required and a very comfortable transfer for the patient is provided. 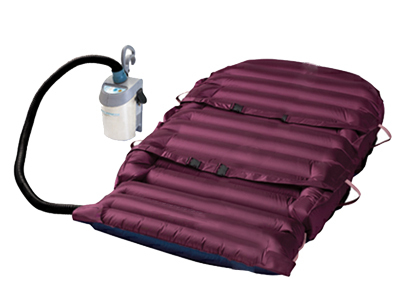 After the patient is placed on the HoverMatt® transfer mattress, low pressure air from the small air supply will inflate the mattress. At the same time the air is supporting the patient, the air is escaping from the perforations in the underside, and acting as a lubricant to reduce friction, which facilitates effortless transfers. With less force needed to transfer a patient, there is less physical effort and strain expended by caregivers which results in a reduction of the workers’ comp injuries. The HoverMatt® technology requires 90% less force than conventional products currently in use. Heat-sealed construction eliminates needle holes to remove potential bacterial entryways. It is ideal for use in any patient care department. It is radiolucent and MRI compatible. Multiple styles and sizes are available to accommodate patient and departmental needs. Powerful, portable air supply provides rapid inflation. The Hovermatt® has no weight limit! 1. Position the Hoverjack® beside the patient with the patients head several inches below the top of the jack. Make sure the chamber with Valve 1 is against the floor at foot end. 2. Place the Hovermatt® directly on top of the jack with the right side up, labels at foot end. 3. Have the patient turned away from the mat/jack. 4. Roll the patient onto jack/mat, centering them. 5. 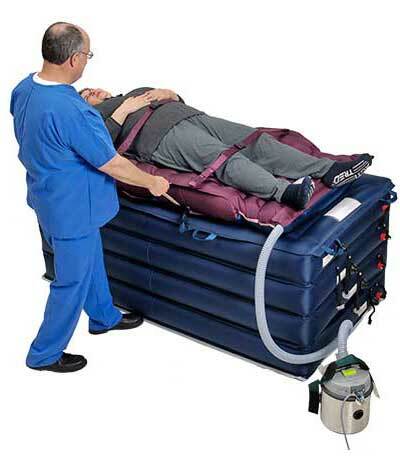 Secure the safety straps from both the Hovermatt®and Hoverjack® over the patient (not too tight). 6. Place a pillow under head to prevent mat from blowing up close to face. Key Point: Tighten red caps prior to blowing mat up to stop air escaping during inflation. Hold hose against valve. Move the hose up to next level valve as mat inflates. 7. Tightly secure all four red caps onto the white valves. 8. Explain procedure to patient, and that it will be noisy. 9. Position care staff on both sides of the mat/jack. 10. Plug in the unit (beware the unit may have been left “on” and will immediately inflate). 11. Hold hose against inlet Valve 1 of jack (the chamber nearest the floor). 12. Turn on air supply; when fully inflated, remove hose. Valve will automatically close itself. 13. Continue process, moving to Valves 2, 3 and 4 in order 14. Turn off air supply and cap the valves. 15. At bed height , use the Hovermatt® to transfer onto a bed/stretcher. 16. Position a bed/stretcher beside the jack/mat, apply brakes and adjust height to slightly below Hoverjack® height. Insert the hose into the mat opening. Snap and Velcro in place. 17. Explain procedure to patient, and that it will be noisy. 18. Position care staff on either side of the mat/jack. 19. Turn on air supply. 20. 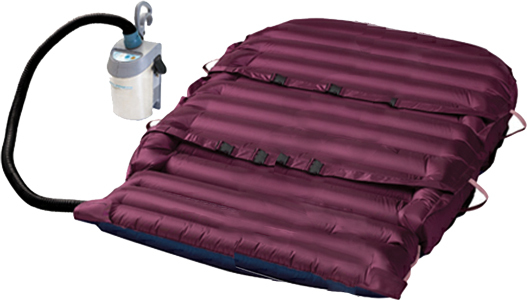 To move the Hovermatt®, release only the Hoverjack® straps, the Hovermatt®/AirPal® straps keep the patient on the mat. 21. Complete the transfer and center the patient on the new bed/surface. 22. Turn off air supply and remove the hose. 23. Leave mat under the patient if more lateral transfers will be required. 24. Deflate the jack by releasing the red caps. Due to the sudden pressurized release of air, do not stand directly in front of the valves. Inflate Hovermatt®, release straps from Hoverjack®. One caregiver gently pushes the Hovermatt® to the new bed. The second caregiver uses a weight shift to pull patient to center of bed. Once mat is deflated, deflate jack by carefully releasing red caps. 1. Clean mats and jack with PerCeptTM wipes or Virox®. Clean Hoverjack® while inflated (top and sides), then deflate by gently releasing red caps ( STAND CLEAR as it is under high pressure) and clean the underside. To prevent airborne chemicals, do not wipe the underside of the mat while inflated. 2. 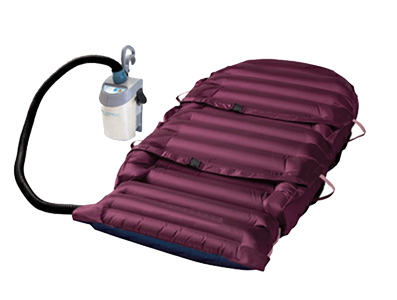 Hovermatt® and AirPal® (and/or nylon cover if used) must be laundered when soiled, if there has been a spillage (even if not visible), or if patient is on any precautions by putting it in the sling/transfer belt laundry (ensure it is labeled with your facility/unit).